Plant-based superfood. New look. Per 5 g Serving: 20 calories; no added sugar; low temp dried. Premium. Plant-based. Nutrient-dense essentials. Superfood. Freeze dried juice powder. Mildly sweet & tart. Antioxidants (ellagic acid)(Contains 2.15 mg of Ellagic Acid per serving). USDA organic. Non GMO Project verified. Nongmoproject.org. Superfood Promise: Using the most health-boosting plants in the world, we promise our superfoods are organic, nutrient-dense & handled with care at every step. Plant based. Ancient treasure. Nutrient dense. Pomegranate: Cultivated for over 7,000 years. Made from the juice of 100% pomegranate seeds. Mildly sweet. Boost. Blend. Top. Use in smoothies, yogurt, cereal, desserts and dressings. Go after each day with passion and drive. Super-simple, super-nutritious superfoods give you the energy you need to live each day to the fullest. In fact, Navitas (Nuh-vee-tus) is Latin for energy. We search the globe for the highest-quality organic superfoods to keep you energized. What's more, we work hard to power the positive in all we do as a company, celebrating healthy foods and supporting sustainable causes. Navitas. Live life positive. 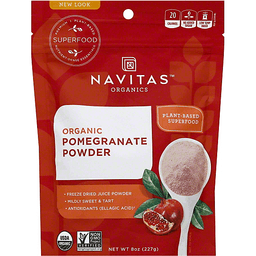 NavitasOrganics.com. Certified B Corporation. Organic. Non-GMO. Kosher. Gluten-free. Vegan. Certified organic by Control Union Certifications CU 802080. BPA free. Moisture absorber included in package (do not eat). Live life positive. Positive mind - positive vibes - positive life. Product of India. 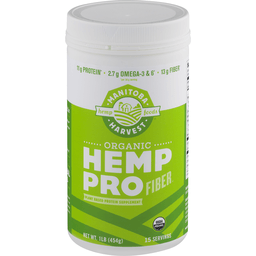 MANITOBA HARVEST ORIGINAL ORGANIC HEMP PRO FIBER IS ONE OF OUR MANY PROTEIN POWDERS PACKED WITH NON-GMO PROJECT VERIFIED NUTRIENTS AND RICH IN USDA ORGANIC CERTIFIED OMEGAS. OUR 1 LB. POUCH OF ORGANIC HEMP PRO FIBER IS PERFECT TO BLEND INTO YOUR FAVORITE SMOOTHIE RECIPE OR STIR IT IN YOGURT OR HOT CEREAL TO ADD A LITTLE NUTRITION TO YOUR MORNING.